Noorjehan Bilgrami in her Sri Lanka studio. A painter, textile designer, gallery owner, entrepreneur, curator, researcher, educationist and a social activist; all these roles aptly define Noorjehan Bilgrami’s dynamic and multifaceted personality. But where does her hear heart truly lie, I asked her, and she gently replied, “It lies with what I’m doing. Pursukoon Karachi has taken over my life these days. When I’m painting, I give all myself to it. I eat and dream everything of that. When I’m with my grandchildren, everything else disappears”. Noorjehan’s transition from being a painter to an entrepreneur and researcher in the crafts industry is inspirational. In the late 1970’s, Noorjehan was occupied with an interior design project when she came across some block printing fabric that instigated her curiosity of how it was made. This led her to discover a workshop of block printing in Lee Market, Kharadar, Karachi. It was there that she found some breathtaking blocks lying neglected under tables. The ones being consumed were marred by their bad color prints and sloppy compositions. “The karkhana, that once thrived before partition, had come to a halt and all the craftsmen became electricians and carpenters,” she said. Driven by the work, richness and potential in the occupation, Noorjehan indulged herself in the craft, developed it into an enterprise and re-energized this indigenous tradition. “I would take my pen, sketches and pieces of cloth and visit the workshop frequently to get work done. The craftsmen keenly helped me. A friend of mine offered me her garage where I eventually started my own small business. I treated the fabric like my canvas and took immense pleasure in playing with the block colors and compositions. The process and its outcome led to an exhibition at the Arts Council in Karachi where everything was sold out.” Introducing this centuries-old craft to home furnishing and women’s apparel gave birth to Koel in 1977, which has now become a nucleus for the arts, housing Koel Gallery, Koel Café, Koel craft shop and Koel publications. “There was no concept of galleries or art gatherings a few decades ago in Pakistan, other than one gallery led by Bashir Mirza and Ali Imam. A strong need was felt for a communal space, where artists and thinkers could sit together to discuss, share and generate ideas. Koel provided that structure for me,” she said. Through this venture, Noorjehan has successfully created an agnostic space that breeds a healthy dialogue amongst aesthetes, intellectuals and learners and allows them to express and channelize their creative energies. “An added mandate for Koel Gallery is to give the crafts its due importance and bridge the gap between the arts and crafts,” she added. Painting with indigo dyes. Detail of recent work: indigo and graphite on paper. Few people know that even before Koel, Noorjehan had established a small gallery called Maharat at her house, which featured Zahoor ul Ikhlaq’s solo show ‘Takhti’ as its first show followed by an exhibition of Aasim Akhter’s photographs. This marked the beginning of Noorjehan’s career as a curator. Over the course of years, she has efficaciously curated ‘Tana Bana: The Woven Soul of Pakistan’, a craft exhibition that travelled to the University of Wisconsin, Madison, Portland, Asia Pacific Museum, California, Tokyo, organized Mian Salahuddin’s ‘Retrospective’ and Shahid Sajjad’s ‘Retrospective’ in Lahore, Karachi and Islamabad and is now leading the show for Pursukoon Karachi with co-curator Arshad Farooqi. Cantt Station being renovated and restored. Noorjehan with members of her Pursukoon Karachi team. As a forerunner in the preservation and documentation of the craft traditions in Pakistan, Noorjehan has also been actively involved in the research and making of traditional Sindhi Ajrak and organic indigo dyes. She studied and documented the techniques and procedures of natural indigo cultivation near the Budh Railway Station in Multan, and replaced chemical dyes with natural dyes for her products. In 2007, she worked as a specialist on Ajrak for the Rural Enterprise Modernization Project, Aik Hunar Aik Nagar (AHAN). “Ajrak, a Sindhi craft, just around the corner, entailed a process of making to die for.” she remarked. Koel indigo dyed fabric. Indigo dyed ajrak spread to dry. Her recent studio work is on Arches paper that readily absorbs indigo dye and the thin layers of acrylic paint. “I applied layered washes that gradually built the depth of colour. I have used rubbings of jaggery boards with graphite on handmade paper, reminiscent of the bygone time when craftspeople painstakingly carved fine geometric designs in relief on wooden boards to pattern jaggery slabs.” That became the foundation, the grid, for her work to develop further, she added. Noorjehan working in a Sri Lanka studio. Activism and social responsiveness through an artistic expression started years ago from a solo show, ‘Crying for the Light’ at Indus Gallery when Noorjehan created art works in response to bomb blasts and sectarian killings within the Pathan and Muhajir groups in Orangi Town. She visited the sight of conflict shortly after, where she saw women creating stuff from the rubble and fallen debris as a result of the destruction. That instance gave her the impetus to shut herself in the studio to create work with cloth, paper and found objects. It served as a release for her to deal with the predicament at hand. ‘Kuch tu Kaho’ was yet another event at Koel Gallery in response to the rut of the chaos and disorderliness of the city. This time, for Noorjehan, Pursukoon Karachi transcends the boundaries of the gallery walls. “The event is way beyond me and even beyond the confines of a gallery space. It reaches out to a larger connection and targets a much wider audience”. One sees a pattern to her preoccupations and philanthropic concerns. The core purpose and philosophy of the Indus Valley School of Art and Architecture in Karachi, was to connect the masses through the arts. Noorjehan was one of the founders and continues to be a major stakeholder and core member of the executive committee of the art school. “We felt a need for the city to have a place like NCA, and expand upon the idea of the arts council, that combined the art and architecture fraternity. Karachi then, was going through a rough period of political turmoil and this initiative again, was to unite the city. Noorjehan was a founder of Indus Valley School of Art and Architecture, Karachi. Despite being intently involved with people and staying proactive in her interpersonal relationships, Noorjehan secretly confesses that there are times in her life when she enjoys being alone and prefers solitude to socializing. “It may be a total contradiction to the persona I have.” What keeps her going, she says, is a desire to keep learning, not giving up and expanding on any opportunity that arises subsequently. Being a woman, she gracefully acknowledges, is always an advantage and coupled with her creativity, wisdom, virtuosity and perseverance, she truly does wonders in all her roles – she is, indeed, our woman of substance! 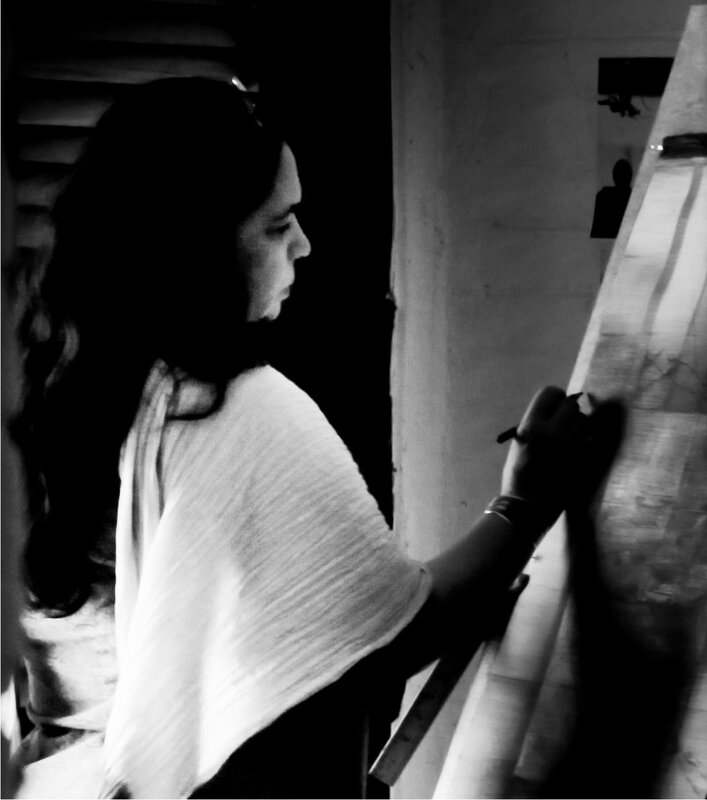 Rabeya Jalil is a visual artist and art educator who is currently affiliated with the Fine Art Department at the Indus Valley School of Art and Architecture, Karachi, Pakistan.